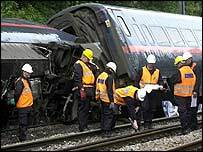 The Hatfield train crash could have been prevented if standards had been followed, the Old Bailey has heard. David Ventry, Railtrack's head of track at the time of the accident, said guidelines were correct and in place. Mr Ventry said that if the standards had been followed "in my opinion the crash would not have occurred". He was giving evidence in the trial of five other rail executives who deny manslaughter charges over the October 2000 crash, which killed four people. Alistair Cook, 50, Sean Fugill, 50, and Keith Lea, 53, three executives from Railtrack, which owned the East Coast Mainline at the time of the derailment, are among those on trial. Two executives from engineering firm Balfour Beatty - Anthony Walker, 46, and Nicholas Jeffries, 53, were also charged. All the men deny all the charges against them. Balfour Beatty faces a corporate manslaughter charge and Network Rail health and safety charges, which are denied. Ronald Thwaites QC, defending contractors Balfour Beatty, asked Mr Ventry whether there was anything he could have done which might have prevented the crash. Mr Ventry replied: "As you can imagine I have searched my conscience on that matter and concluded I acted entirely properly and professionally. "One can always reflect on whether one could have done things differently. I believe I behaved entirely correctly." Mr Ventry said there were no specifics relating to the Hatfield accident that he would have done substantially differently. "With the knowledge I had at the time I would not have done anything differently," he said. The court has heard that after an earlier broken rail incident Mr Ventry sent out an urgent letter. It highlighted the problem of gauge corner cracking (GCC) , which was known to cause broken rails, and recommended that checking procedures on tracks should be enhanced. Robert Alcorn, 37, from New Zealand, Steve Arthur, 46, of Pease Pottage, West Sussex, Leslie Gray, 43, of Tuxford, Nottingham and Peter Monkhouse, 50, of Headingley, Leeds, were killed when the London to Leeds GNER express derailed. Survivors of the disaster were called as witnesses at the trial last month.